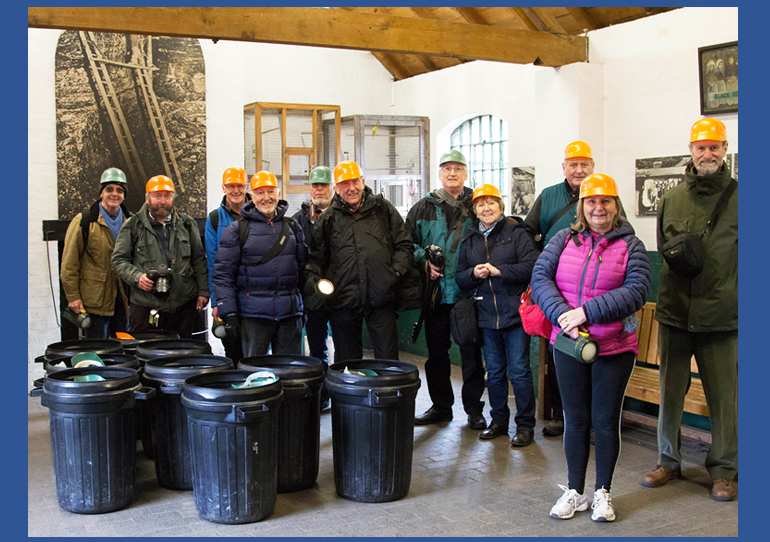 Fourteen members of MCCC enjoyed a day’s photography at the Black Country Living Museum, Dudley. One of the highlights of the day was a trip down the drift coal-mine and the picture shows everyone wearing their hard hat before the descent on foot. The low ceiling was a challenge for the taller members and all agreed it was a real eye opener into the harsh conditions that many endured in order to earn a living. We were reminded that the average life expectancy of a miner was around 40 years and that the employer called the “butty” was not averse to cutting corners such as using as few pit props as possible which saved him money but put workers’ lives at risk. The day finished with a lesson in the Victorian school where we were reminded of the important Christian values of the era including respect for one’s elders and cleanliness. One school boy whose finger nails were deemed not to be clean enough was made to stand in the corner with his hands on his head while another whose mental arithmetic was rather shaky was given the cane across the back of his hand – all done in a light-hearted spirit of course! A ride on the tram took us out of the village and back to the modern world of potholes and traffic jams. After a day full of thought-provoking nostalgia I think we all appreciated the comfort and convenience of our homes a little bit more.